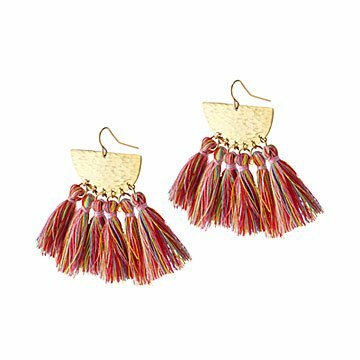 Amy Shepsman constructs each colorful tassel by hand for these bold, playful earrings. Life's more interesting on the fringe. Celebrate your tendency to take the road less traveled with Amy Shepsman's bold, playful earrings. The design was inspired by a trip to Thailand, and each colorful tassel is put together by hand, then paired with a hand-hammered semi-circle of 18k gold-plated sterling silver. Growing up in Great Neck, New York, Amy had a taste of both town and country—you'll find that inspiration in her jewelry, which artfully blends the colors and textures of earthy elements with the sleek, sharp architectural shapes of the city. Handmade in New York City.